Saint John IV the Faster, Patriarch of Constantinople (582-595), is famed in the Orthodox Church as the compiler of a Penitential nomokanon (i.e. Law-Canon of penances), which has come down to us in several distinct versions. But their foundation is one and the same. This – is an instruction for priests, how to hear a secret confession of secret sins, be this a sin already committed or constituting merely a sin of intent. Ancient churchly rules address the manner and duration of churchly public penances, established for obvious and evident sinners. But it was necessary to effectively adapt these rules for the secret confession of undetected things being repented of. Saint John the Faster because of this issued his Penitential nomokanon (or "Canonaria"), so that the good-intentioned confession of secret sins, unknown to the world, already testifies to the disposition of the sinner and his conscience in being reconciled to God, and therefore the saint shortened the penances by the ancient fathers by half or more. Yet on the other hand, he set more exactly the character of the penances: severe fasting, daily performing of an established number of prayerful prostrations to the ground, the distribution of alms. The length of penance is determined by the priest. The main purpose of the nomocanon, compiled by the holy Patriarch, consists in establishing penances not simply by the measure of sins, but by the measure of admitting the confessed, and through the appraisement of penitence not by continual punishment, but through the extent of the experience to be confessed, one's spiritual state. Among the Greeks, and afterwards also in the Russian Church the rules of Saint John the Faster are honoured on a level "with other saintly rules", and the law-canons of his book are accounted "applicable for all the Orthodox Church". The Monk Nicodemos of the Holy Mountain (Nikodim Svyatogorets, Comm. 1 July) included him in the Greek handbook for priests (Exomologitaria), first published in 1796, and in the Greek "Rudder Book" (Pedalion), published by him in 1800. 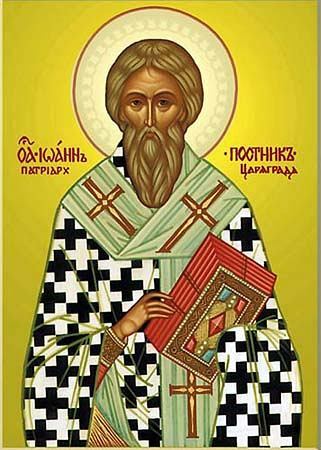 The first Slavonic translation was done quite possibly by the holy Equal-to-the-Apostles Methodios, at the same time as he produced the "Nomocanon in 50 Titles" of the holy Patriarch John Scholastikos, whose successor on the Constantinople cathedra-seat was Saint John the Faster. This ancient translation was preserved in Rus' in the "Ustiug Rudder" (XIII), published in 1902. From the XVI Century in the Russian Church was circulated the nomocanon of Saint John the Faster in another redaction, compiled by priest-monks and clergy of Holy Mount Athos. In this form it was repeatedly published at the Kievo-Pechersk Lavra (in 1620, 1624, 1629). In Moscow the Penitential Nomokanon was published in the form of a supplement to the Trebnik ("Book of Needs"): under Patriarch Joasaph in 1639, under Patriarch Joseph in 1651, and under Patriarch Nikon in 1658. The last edition since that time invariably is that printed in the Large Trebnik. A scholarly edition of the nomocanon with parallel Greek and Slavonic texts and with detailed historical and canonical commentary was done by A. S. Pavlov (Moscow, 1897).